This is Bill Dollarsaurus. They list the artist as Dymun and Company, but they're not really artists, per se. They're a think tank/PR company. 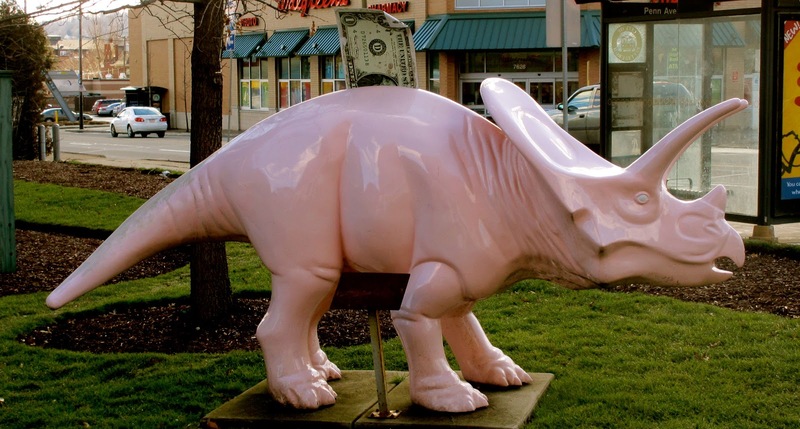 Since this dino was sponsored by Dollar Bank, it appears that the bank’s PR firm came up with a clever way to brand the dino without really needing to hire an artist. They did a take off on the classic pink piggy bank with a dollar bill in the slot. Simple and effective. His name may be Bill Dollarsaurus, but most refer to him as The Dollar Bank Dinosaur .